Surprise! Microsoft claims Twitch streaming will be up and running in time for what it hopes will be the next big multiplayer hit. 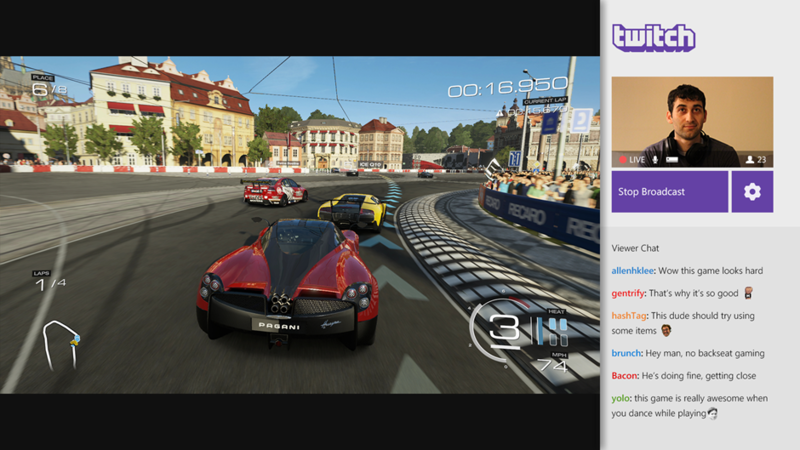 From March 11, you'll be able to livestream your Xbox One gameplay to Twitch, it seems. Speaking with Associated Press, Twitch CEO Emmett Shear appeared particularly excited about the integration of Twitch with the Xbox One's OS, enthusing at length about the options for viewers to be able to join a broadcaster's party and the option to use Kinect as a means of broadcasting from the living room. He also noted that the Xbox One version would be the full Twitch experience, rather than the cut-back offering on PlayStation 4, which only allows PS4 viewers to spectate other PS4 players. "For us, we thought that was too limiting for what our fans would want," said Microsoft's VP of marketing and strategy for Xbox, Yusuf Mehdi. "Our fans really want the full next-gen service, so that's why we decided to take our time, do it right and have it come out in this fashion." Twitch on Xbox One will be integrated with the console's voice commands -- once you've set up your Twitch account, all you need to do is say "Xbox, broadcast" to begin streaming. Your Twitch activity will appear in the Friends app and the activity feed of your followers, whether you're broadcasting or watching, and you can set up notifications for when favorite broadcasters are on air. A 10-line chat bar is a little more practical than what the current PS4 app offers, and allows those in chat to use custom name colors and emoticons. The lack of swearing, spamming and people yelling "raise your dongers" in this screenshot makes me believe the chat panel may be a mockup. The launch date for Twitch on Xbox One is no coincidence -- it's also the release date for Respawn's first-person shooter Titanfall, which you may have heard of. As a high-profile, multiplayer-centric competitive game eminently suitable for e-sports, Titanfall is perhaps the ideal showcase for the Xbox One's new streaming functionality -- not to mention a much-needed "not also on PlayStation" title with which Microsoft can attempt to claw back some of the lead Sony has picked up with the PlayStation 4. Representatives from Twitch said that 20 per cent of the service's broadcasts between December 23 and January 3 were from PlayStation 4 owners, and more than 1.7 million streams have been broadcast from PS4 since the console's launch in November. It will be interesting to see what the launch of simple, straightforward streaming on Xbox One does to the figures -- and to the popularity of streaming as a whole. It will also be interesting to see what Microsoft's response to the inevitable use of Kinect for some... less than family-friendly streams will be, since this proved to be a problem around the PS4's launch. "This will open up the social aspect of Xbox One in a new way," continued Mehdi. "The community of Twitch is huge, and this allows us to frankly do something that's never been done before on consoles. You'll be able to broadcast to any device and consume anyone's broadcast from any device. It's a console experience unique to the Xbox One." Perhaps not for long, though; while the current Sony-developed Twitch app on PS4 is a little limited in comparison to what the new Xbox One version will offer, Shear said he hopes that the capabilities of the Xbox One app will eventually make it to other devices, including the PS4. Tagged with Microsoft,	News,	Titanfall,	Twitch,	Xbox One.